On a trip to Yellowstone a few years ago, my wife and I spotted a woodpecker that was orange and tan. We had no idea what kind of bird it was, but it certainly acted like a woodpecker, gripping the side of a tree with its feet and drilling into the bark. We thought all woodpeckers were black, white, and red (or red and blue, like in the cartoon). After giving several rangers a weak description and having no luck, we took the plunge and bought a birding book. Since then, we have a developed a true love for the birds of Utah. To learn about our initiation in the birder's world, check out this link which gives details on books, binoculars, and how to get started. 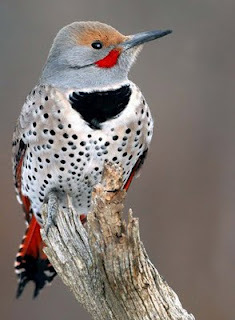 (By the way, the woodpecker in question is a Northern Flicker.) To find some of our favorite places to go birdwatching in Utah, click Beus Pond, Tracy Aviary, Bald Eagles, Antelope Island, Bear River Refuge, or Utah Lake. You can also visit Utah Valley Family Adventures and click the Bird Watching tab.